Forgive me please for the delay in getting Sepia Scenes online for you today. 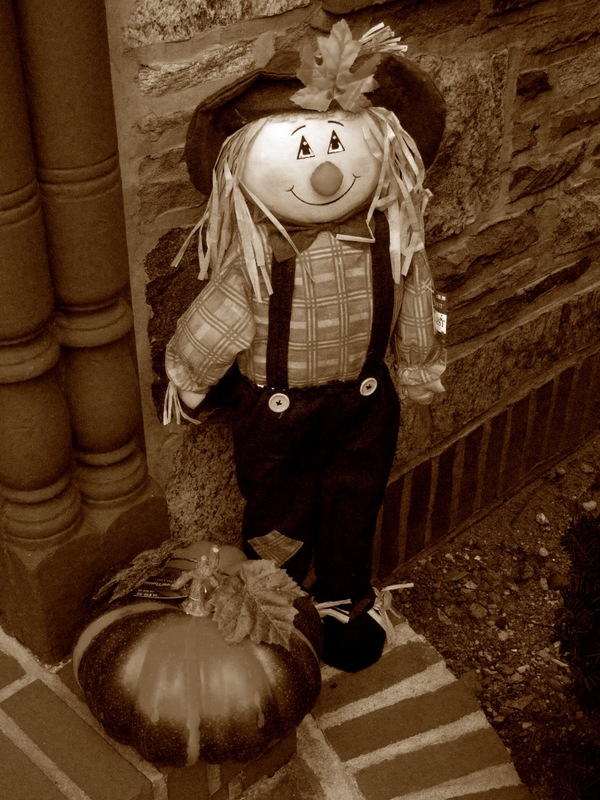 I hope you like my sweet-faced scarecrow in front of my house. Mr. Linky is below for you to tell me what you have for today. I like it! I like it a lot. he is very cute--especially in a very fall like sepia tone. Love it! So great for the season. Screams Fall! Haha! I think I'll put up a decor this year! How can anything be afraid of the winsome fellow?? He´s soooo cute :-) Lovely in sepia. Hi Mary... so glad you're okay. I was getting worried about you. Can you post when you normally expect to put up the linky for your memes? I'm linked to two today. I'm probably 12 hours in your future, so I was checking back here all day. I really like the light on your funny scarecrows face. Good one! Funy fall sepia scene. Cute. Come see my farm sepias!